This letter was written to Henry Eeles Dresser (1838-1915), an English ornithologist, on 28 April 1871 - a time when Wallace was well and truly settled back into life in England after his expeditions to the Amazon and the Malay Archipelago. I chose this letter as it reveals not only information about the next big publication he was working on but also more about another great passion he had; building houses. Wallace lived in a fair few places throughout his life; on his return to England from the Malay Archipelago in 1862 he rented a few different properties in London, before building his first house, The Dell, in Grays Essex, living there from 1872-1876. He then moved again and rented three different houses, one in Surrey and two in Croydon, before building his second home Nutwood Cottage in Godalming Surrey, living there from 1881-1889. In 1889 he moved west to Dorset, renting and then buying Corfe View in Parkstone. He built his last home, Old Orchard in Broadstone, Dorset, and lived there from 1902 until his death in 1913. 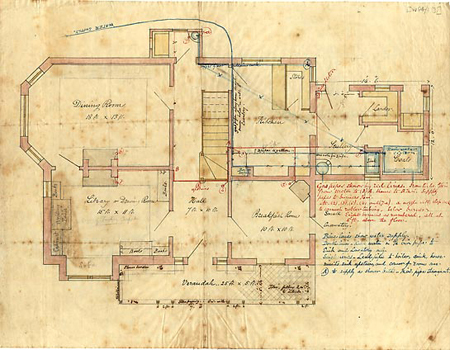 His training as a land surveyor early on in his life no doubt had an enormous impact on his ability to plan his houses as he wanted them - his superb draughtsmen skills are reflected in some original plans we hold in the Wallace archive in the Museum’s library. Above: Ground plan of The Dell, by Wallace c. 1871 (WP4/1/3). Plan of the front view of The Dell, c.1871 (WP4/1/4). It took a year to build the Dell and he moved in on 25 March 1872. Prior to this, he was renting a house in Barking, East London, which isn’t too far away from Grays. His move to Grays and desire to build a house was no doubt partly influenced by his young family. He had married Annie five years previous in 1866 and three children quickly arrived; Herbert in 1867, Violet in 1869 and William in 1871. A move to Grays, which was surrounded by countryside, whilst still being close to London by train for business, seemed the best of both worlds. The Dell, the first house Wallace built, once complete. The Dell was one of the first houses in England to be built mainly of concrete, facilitated by a cement works nearby. The architect was Thomas Wonnacott of Farnham and it is the only house Wallace built that still survives - today it is privately owned but can still be seen from the road. The Wallace Memorial Fund designed and paid for a commemorative Thurrock Heritage Plaque to be placed on The Dell in 2002. Quite timely for this blog post also is the fact that The Dell has just been put on the market. Anyone rich enough and who wanted to, could live in the house that Wallace built! Whilst at The Dell, Wallace wrote and published one of his landmark texts - The Geographical Distribution of Animals: With a study of the Relations of Living and Extinct Faunas as Elucidating the Past Changes of the Earth’s Surface. It is also the other reason I chose this letter to feature as letter of the month. Wallace writes to Dresser, after urging him to write a paper on the “Birds of Scandinavia & Northern parts of the Palearctic Region”, that he expects he won’t have time until the autumn to “work at the subject of Geog. Distribution… when I hope to be settled in my new abode”. In fact, Wallace wasn’t able to really start work on Geographical Distribution in earnest until 1874 due in part to problems with assembling the taxonomic classifications for many types of animals, which were not clearly defined and in flux during this period. Philip Lutley Sclater had developed an earlier map showing the world distribution of birds which Wallace built on and expanded in his study to include mammals, reptiles and insects. Wallace's landmark text spilt the world into six distinct zoogeographic regions (known as Wallace's Realms) which are still in use today and he is known as the “father of evolutionary biogeography” because of his contribution to the founding of the subject. Wallace had been observing the geographical distribution of species since his time in the Amazon from 1848-1852 and continued these observations in the Malay Archipelago. He would make notes during his travels on this topic and he gradually realised that the species of a particular region are generally more closely related to each other than they are to species in other regions. It was only realised much later that the reason that Wallace's Realms more-or-less correspond to the Earth's continents is a result of plate tectonics. The ‘Wallace Line’, named in his honour, separates the zoogeographic regions of Asia and Australasia and was discovered by Wallace in June 1856 as he made the short 22 mile journey from Bali to Lombok. He observed many distinct differences amongst the animal species on the two islands. One example that illustrates the many differences he observed is the presence of cockatoo’s on Lombok, which were generally found to have a mainly Australasian distribution. No doubt his early surveying training also had a part to play in this work, as it gave him a keen sense of how things are spatially arranged. The Wallace Collection pages on the Natural History Museum’s website features key items from the Wallace archive, including a section on architecture and plans of the three houses he built, as well as some observations made by Wallace on geographical distribution.